Lighting users are often familiar with many of the more well-publicized benefits of LED technology, including their high energy efficiency, long life, and low maintenance requirements. But not everyone is aware of another material benefit that LEDs can deliver -- significant reductions to a facility’s HVAC costs thanks to their cooler-running properties. Lake Shore Middle School in Mequon, WI recently experienced this benefit first-hand. 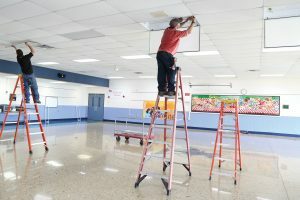 After undertaking a lighting upgrade from fluorescent to LED technology in the 1960s-era building, Mequon-Thiensville School District Director of Facilities Kyle Thompson went to the effort of quantifying the impact of HVAC cost reductions that resulted from the upgrade and found that they really added up. To be sure, conversion from the school’s previous T8 fluorescent lamps to Litetronics’ LED Magnetic Retrofits significantly reduced energy consumption and cost based on straight wattage reductions. But because LEDs don’t require ballasts to operate, “we were also able to remove over 660 fluorescent ballasts, each of which emitted about 150 BTUs of heat,” Thompson said of the facility’s upgrade to LEDs. Thompson calculated that, in total, the middle school’s upgrade to LEDs enabled the removal of nearly 100,000 BTUs -- some 8½ tons -- of cooling load out of the building through the removal of the ballasts alone. “The average 2,500 square-foot home would typically be powered by a 3-ton AC unit, so the removal of just the ballasts in our Lake Shore building avoided the equivalent of three homes’ worth of AC load,” he said. The cool-running properties of LED technology that help reduce the strain on AC systems in warmer months may indeed necessitate the need for more heat in cooler months. However, Thompson said that this reality hasn’t added an equivalent cost to his school district’s utility bills. “While our LED upgrade has required us to use more heat in our buildings in the winter, natural gas is so plentiful and so much less expensive than electricity that it’s still a win-win for us financially,” he explained. Thanks to the lesser-publicized but equally valuable HVAC reductions that can be driven by LEDs, Lake Shore Middle School is now poised for a productive and highly-sustainable future. In a budget-conscious school district that relies on taxpayer funds to operate and takes a fiduciary responsibility towards its assets, “were excited that, thanks to our new Litetronics LEDs, the community will be coming into more energy-efficient buildings that are better lit and better managed than ever,” Thompson said.